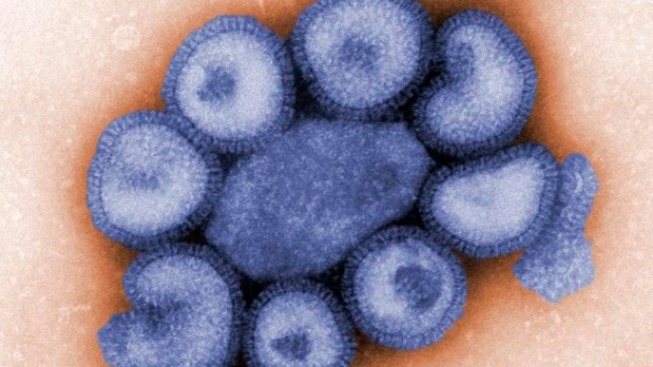 This image taken through a microscope and provided by the Center for Disease Control and Prevention shows the H1N1 strain of the swine flu virus. The World Health Organization increases its tally of confirmed swine flu cases around the world to 257 from 148. WHO says it will stop using the term "swine flu" to avoid confusion over the danger posed by pigs. It will instead refer to the virus by its scientific name, "H1N1 influenza A." 168 deaths in Mexico, 12 confirmed as swine flu and rest suspected. 2,955 suspected sick and 300 confirmed in Mexico. 131 confirmed cases in U.S. 23-month-old child in Texas first confirmed death from swine flu in the United States. 34 confirmed in Canada; four in New Zealand; eight in Britain; three in Germany; 13 in Spain; two in Israel; and one in Austria, Switzerland and the Netherlands. U.S. Food and Drug Administration issues emergency guidance allowing certain antiviral drugs to be used in broader range of population if needed. Public health emergency declared and roughly 12 million doses of Tamiflu from federal stockpile to be delivered to states. Cuba, Ecuador and Argentina ban travel to and from Mexico; Peru bans flights from Mexico; U.S., European Union, other countries discourage nonessential travel there. Arriving travelers questioned at Mexico's U.S. border and world airports. Cruise lines avoid Mexico ports. Mexico suspends all schools until May 6. In U.S., some schools closed in Illinois, New York City, Texas, California, South Carolina, Connecticut, Minnesota and Ohio; Texas school closings affected 130,000 children; President Barack Obama says more closings may be necessary. Mexico City hands out surgical masks, closes public venues and cancels public events. President assumed new powers to isolate infected people. World Bank loaning Mexico more than $200 million. Egypt begins slaughtering nation's roughly 300,000 pigs as precaution. World Health Organization alert at Phase 5 of 6, meaning disease spreads easily but isn't pandemic. WHO head called on all nations to "immediately...activate their pandemic preparedness plans." $200 million loaned from World Bank to Mexico to battle the crisis. The U.S. government comes out against closing the U.S.-Mexico border. Vice President Joe Biden says it would be "a monumental undertaking" with limited benefit.